It is customary with men of the world to balance their accounts at the end of the year, and ascertain their profits. The Church is now preparing to do the same. We shall soon see her solemnly numbering her elect, taking an inventory of their holy relics, visiting the tombs of those who sleep in the Lord, and counting the sanctuaries, both old and new, that have been consecrated to her divine Spouse. But today’s reckoning is a more solemn one, the profits more considerable: she opens her balance sheet with the gain accruing to our Lady from the mysteries which compose the Cycle. Christmas, the Cross, the triumph of Jesus, these produce the holiness of us all; but before and above all, the holiness of Mary. The diadem which the Church thus offers first to the august Sovereign of the world, is rightly composed of the triple crown of these sanctifying mysteries, the causes of her joy, of her sorrow, and of her glory. The joyful mysteries recall the Annunciation, the Visitation, the Birth of Jesus, Mary’s Purification, and the Finding of our Lord in the Temple. The sorrowful mysteries bring before us the Agony of our blessed Lord, his being scourged, and crowned with thorns, the carrying of the Cross, and the Crucifixion. While in the glorious mysteries, we contemplate the Resurrection and Ascension of our Savior, Pentecost, and the Assumption and Coronation of the Mother of God. Such is Mary’s Rosary; a new and fruitful vine, which began to blossom at Gabriel’s salutation, and whose fragrant garlands form a link between earth and heaven. Thus speaks the great Pontiff who, in the universal sorrow of these days, has again pointed out the means of salvation more than once experienced by our fathers. Leo XIII, in his Encyclicals, has consecrated the present month to this devotion so dear to heaven; he has honored our Lady in her Litanies with a new title, Queen of the most holy Rosary; and he has given the final development to the solemnity of this day by raising it to the rank of a second class Feast, and by enriching it with a proper Office explaining its permanent object. Besides all this, the Feast is a memorial of glorious victories which do honor to the Christian name. Soliman II, the greatest of the Sultans, taking advantage of the confusion caused in the West by Luther, had filled the sixteenth century with terror by his exploits. He left to his son, Selim II the prospect of being able at length to carry out the ambition of his race: to subjugate Rome and Vienna, the Pope and the Emperor, to the power of the Crescent. The Turkish fleet had already mastered the greater part of the Mediterranean, and was threatening Italy when, on the 7th of October, 1571, it came into action, in the Gulf of Lepanto, with the pontifical galleys supported by the fleets of Spain and Venice. It was Sunday; throughout the world the confraternities of the Rosary were engaged in their work of intercession. Supernaturally enlightened, St. Pius V watched from the Vatican the battle undertaken by the leader he had chosen, Don John of Austria, against the three hundred vessels of Islam. The illustrious Pontiff, whose life’s work was now completed, did not survive to celebrate the anniversary of the triumph; but he perpetuated the memory of it by an annual commemoration of our Lady of Victory. His successor, Gregory XIII, altered this title to our Lady of the Rosary, and appointed the first Sunday of October for the new Feast, authorizing its celebration in those churches which possessed an altar under that invocation. A century and a half later, this limited concession was made general. As Innocent XI in memory of the deliverance of Vienna by Sobieski, had extended the Feast of the most holy Name of Mary to the whole Church; so, in 1716, Clement XI inscribed the Feast of the Rosary on the universal Calendar, in gratitude for the victory gained by Prince Eugene at Peterwardein, on the 5th of August, under the auspices of Our Lady of the Snow. This victory was followed by the raising of the siege of Corfu, and completed a year later by the taking of Belgrade. Mass.—The joys experienced on the other Feasts of the Mother of God are all gathered up and resumed in this one, for us, for the Angels, and for our Lady herself. Like the Angels, then, let us offer, together with Mary, the homage of our just delight to the Son of God, her Son, her King and ours. Gaudeamus omnes in Domino, diem festum celebrantes sub honore beatæ Mariæ Virginis: de cujus solemnitate gaudent angeli, et collaudant Filium Dei. Let us all rejoice in the Lord, celebrating a festival day in honor of the blessed Virgin Mary, on whose solemnity the angels rejoice, and give praise to the Son of God. Ps. Eructavit cor meum verbum bonum: dico ego opera mea Regi. ℣. Gloria Patri. Gaudeamus. Ps. My heart hath uttered a good word: I speak my works to the King. ℣. Glory, &c. Let us all. The mysteries of the Son and of the Mother are our instruction and our hope. The Church prays in the Collect that they may be also our rule of life and our pledge of eternal happiness. Deus, cujus Unigenitus per vitam, mortem, et resurrectionem suam nobis salutis æternæ præmia comparavit: concede quæsumus; ut hæ mysteria sanctissimo beatæ Mariæ Virginis Rosary recolentes, et imitemur quod continent, et quod promittunt assequamur. Per eumdem Dominum. O God, whose only-begotten Son, by his life, death, and resurrection, procured for us the rewards of eternal salvation; grant, we beseech thee, that commemorating these mysteries in the most holy Rosary of the blessed Virgin Mary, we may imitate what they contain, and possess what they promise. Through the same Lord &c.
Then is made a commemoration of the occurring Sunday. Lectio libri Sapientiæ. Lesson from the Book of Wisdom. Dominus possedit me in initio viarum suarum antequam quidquam faceret a principio. Ab æterno ordinata sum, et ex antiquis, antequam terra fieret. Nondum erant abyssi, et ego jam concepta eram. Nunc ergo, filii, audite me: beati qui custodiunt vias meas. Audite disciplinam, et estote sapientes, et nolite abjicere eam. Beatus homo qui audit me, et qui vigilat ad fores meas quotidie, et observat ad postes ostii mei. Qui me invenerit, inveniet vitam, et hauriet salutem a Domino. Our Lady’s mysteries are before all time in God’s sight, like those of her divine Son; like these they will endure for all eternity; like them they rule the ages, which circle round the Word and Mary, preparing for both in the days of figures, perpetuating their presence by the incessant glorification of the most holy Trinity, in whose name all Christians are baptized. Now the Rosary honors all this series of mysteries; today’s Feast is a glance back upon the Cycle as it draws to its close. From these mysteries, from this view of them, we must draw the conclusion formulated by our Lady herself in this passage from Proverbs, which the Church applies to her: “Now therefore, my children, consider my ways; imitate me, that you may find happiness.” Blessed is he that watcheth at her gate! Let us pray to her, rosary in hand, considering her at the same time, meditating on her life and her greatness, and watching, were it but for a quarter of an hour, at the entrance of the palace of this incomparable Queen. The more faithful we are, the more assured will be our salvation and our progress in true life. 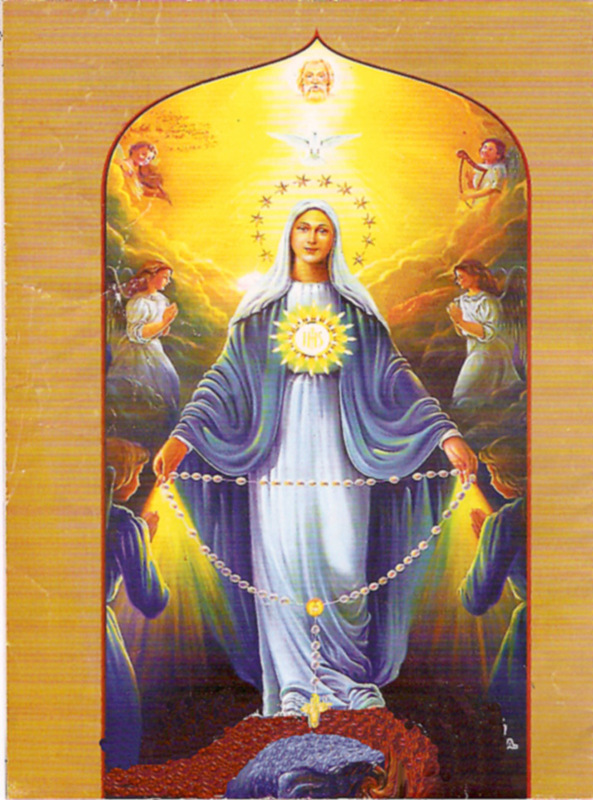 In the Gradual, let us congratulate the Queen of the holy Rosary on her perfect life, all truth, and justice, and meekness, which won her the love of the supreme King. In the Alleluia Verse, let us proclaim the nobility of her race, unequalled in the whole world. Propter veritatem et mansuetudimen, et justitiam, et deducet te mirabiliter dextera tua. Because of truth and meekness and justice: and thy right hand shall lead thee marvellously. ℣. Audi filia, et vide, et inclina aurem tuam: quia concupivit Rex speciem tuam. ℣. Hearken, O daughter, and see, and incline thine ear: for the king hath greatly desired thy beauty. ℣. Solemnitas gloriosæ Virginis Mariæ ex semine Abrahæ, ortæ de tribu Juda, clara ex stirpe David. Alleluia. ℣. It is a festival of the glorious Virgin Mary of the seed of Abraham; sprung from the tribe of Juda, from David’s renowned lineage. Alleluia. The Gospel is the same as on the Feast of the most holy Name of Mary. “At that time, the Angel Gabriel was sent from God, into a city of Galilee, called Nazareth, to a Virgin espoused to a man whose name was Joseph, of the house of David; and the Virgin’s name was Mary. And the Angel being come in, said to her: Hail, full of grace! the Lord is with thee; blessed art thou among women.” Blessed art thou among women, repeated Elizabeth a few days later, and blessed is the fruit of thy womb.—These two salutations, with the name of Mary added to the Angel’s greeting and the name of Jesus to Elizabeth’s, constituted the Ave Maria in the time of St. Dominic, the promulgator of the Rosary. The prayer, Holy Mary Mother of God which now so beautifully completes the formula of praise, received the sanction of the Church in the sixteenth century. No better Gospel could then have been chosen for today, for it gives the original text of the Rosary, and describes the first of its mysteries. All grace, all light, all life, are to be found in our Lady; by her holy Rosary she, as we sing in the Offertory, has multiplied flowers and fruits in the garden of the Church. Every offering acceptable to God comes from Mary, with and by Jesus. In me gratia omnis viæ et veritatis; in me omnis spes vitæ et virtutis; ego quasi rosa plantata super rivos aquarum fructificavi. In me is all grace of the way and of truth: in me is all hope of life and of virtue: I have flowered forth like a rose planted by the brooks of water. As the Secret tells us, the Rosary, piously meditated, prepares us for the Sacrifice of the Altar, that supereminent and august memorial of the mysteries which it imprints in the heart and mind of the Christian. Fac nos, quæsumus Domine, his muneribus offerendis convenienter aptari: et per sanctissimi Rosarii mysteria sic vitam, passionem, et gloriam Unigeniti tui recolere, ut ejus digni promissionibus efficiamur. Qui tecum. Do thou, we beseech thee, O Lord, render us fit suitably to offer up these gifts: and by means of the mysteries of the most holy Rosary, so to call back to mind the Life, the Passion, and the Glory of thine only-begotten Son, as to be made worthy of his promises: Who with thee liveth and reigneth &c.
The Preface as on the 8th of September, substituting in solemnitate, on the solemnity, for in Nativitate, on the Nativity, of the Blessed Virgin Mary. After the sacred Banquet, our soul must not remain barren. The fragrance of virtue’s flowers must embalm all that surrounds us, and prove to the Spouse that his visit has not been made in vain. Florete flores quasi lilium, et date odorem, et frondete in gratiam, collaudate canticum, et benedicite Dominum in operibus suis. Flower ye forth like the lily, and yield ye a sweet smell, and bring forth leaves in grace: sound forth a canticle of praise, and bless ye the Lord in his works. In the Postcommunion, the Church prays that our Lady may, by her intercession, sound the effects of this Sacrifice, and of the mysteries in which she played so great a part. Sanctissimæ Genitricis tuæ, cujus Rosarium celebramus, quæsumus Domine, precibus adjuvemur: ut et mysteriorum, quæ colimus, virtus percipiatur, et sacramentorum, quæ sumpsimus, obtineatur effectus. Qui vivis. We beseech thee, O Lord, to help us through the prayers of thy most holy Mother, the feast of whose Rosary we are celebrating: that we may both experience the virtue of the mysteries of which we meditate, and also obtain the effect of the Sacrament which we have received. Who livest and reignest &c.
Then is added the Postcommunion of the Sunday, and the Gospel of the same is read at the end of the Mass.